We are happy you are using our headsets. We would like to give you some tips on how to make sure you keep these great products functioning well. After all, a clear communication with your customer helps to optimize productivity and profitability. It is important to make sure your crewmembers are well trained in using your drivethru equipment. 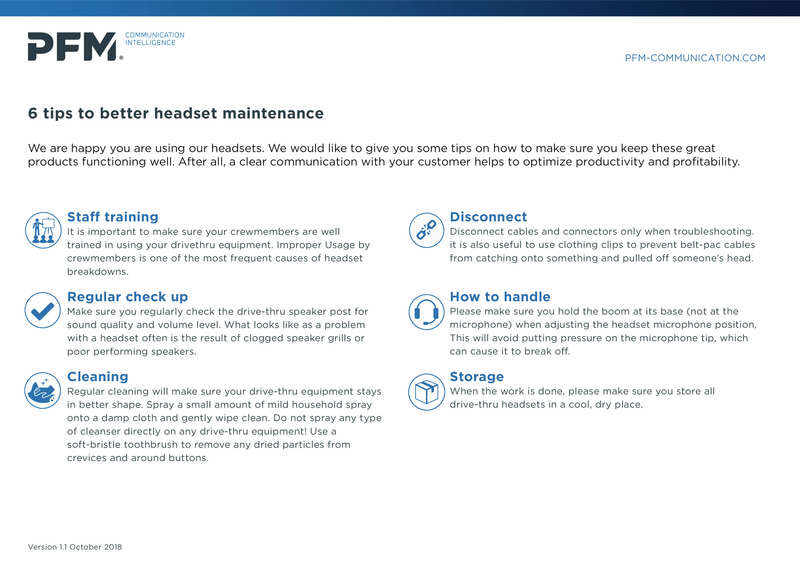 Improper Usage by crewmembers is one of the most frequent causes of headset breakdowns. Make sure you regularly check the drive-thru speaker post for sound quality and volume level. What looks like as a problem with a headset often is the result of clogged speaker grills or poor performing speakers. Regular cleaning will make sure your drive-thru equipment stays in better shape. Spray a small amount of mild household spray onto a damp cloth and gently wipe clean. Do not spray any type of cleanser directly on any drive-thru equipment! Use a soft-bristle toothbrush to remove any dried particles from crevices and around buttons. Disconnect cables and connectors only when troubleshooting. it is also useful to use clothing clips to prevent belt-pac cables from catching onto something and pulled off someone’s head. Please make sure you hold the boom at its base (not at the microphone) when adjusting the headset microphone position, This will avoid putting pressure on the microphone tip, which can cause it to break off. When the work is done, please make sure you store all drive-thru headsets in a cool, dry place. Want to share this with your colleagues? Please click here for a printer friendly version.